THIS BOOK TALKS ABOUT KINESIOLOGY. BUT WHATEVER IS SO ABOUT KINESIOLOGY IS SO, OF COURSE ABOUT DOWSING. READING THIS BOOK, YOU WILL GET MUCH MORE POWERFUL IDEAS OF WHAT DOWSING CAN DO FOR YOU AND HOW TO USE DOWSING IN DIFFERENT WAYS: TO RAISE YOUR CONSCIOUSNESS WHICH LEADS TO A HIGHER MASS CONSCIOUSNESS --- WHICH IS --- IN CASE YOU DIDN'T REALIZE IT, KIDDO, ---- EXACTLY WHAT YOU ARE SUPPOSED TO BE DOING!!!! The contact information for David Hawkins' publishing company so you could purchase this book, his other books and all his tapes. Below is a letter I received from David Hawkins' lawyers. 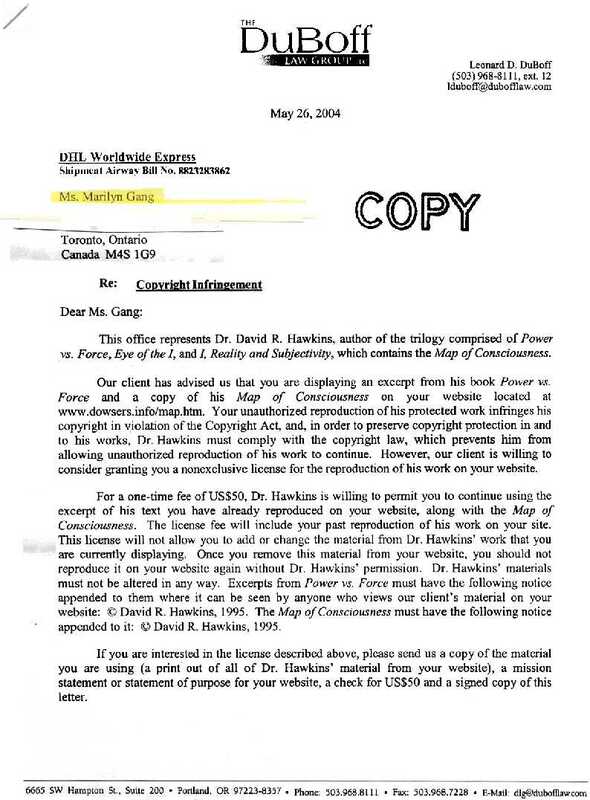 1) I had never been contacted by David Hawkins or his publishers prior to this lawyer letter in any way shape or form. If they had contacted me I would have gladly taken it down. Sending this intimidating threatening lawyer letter is not nice. 2) In my layperson's understanding of copyright law, I deliberately set out to create a page that was a review, where some excerpted material is permissible. What I had created and posted is well within those limits. 3) This is a highly inappropriate use of Power and of Force. It demonstrates a lack of integrity. Does he calibrate the LOC of his lawyers? He ought to. Somebody is lying here. The letter states: "Our client has advised us that you are displaying....". Previously they stated their office represents Dr. David R. Hawins. So that means that Dr. David R. Hawkins had advised them. Yet, when queried, I was told that Dr. David R. Hawkins knew nothing about this letter! 4) They should have sent me a huge commission check instead, due to the hundreds of people I introduced to his work and the dozens of books that were sold on my recommendation. There is more to this story. Scroll down past the letter. So the letter is the first exhibit. I commented on the mean and heavyhanded treatment. So I then received a letter from his publisher. If I thought the lawyer letter was not nice, this next one was not nice x 10.